Every now and then I come across a website that is really worth your time. One of those sites is www.SpellingCity.com. Did I mention that it’s free? Additionally, if you create a user account (also free) you can save your lists for future use. This can be handy if you want to sit down once for an hour or so and prepare all of the vocabulary quizzes you’ll need all year in one sitting. Once you’ve set it up, just have students pull up the appropriate list and get to work! P.S. The site has a vocabulary of 38,000 words. As a smarty pants, I typed in “discombobulation” and the site correctly pronounced the word and correctly used it in a sentence. I was blown away. Change is in the air. Hope for a more unified world and a more balanced role in that world is upon us. To help re-align our thinking with the demands of the new world, I suggest revisiting some of the forward-thinking tools from our recent past. One of these tools is the Hobo-Dyer Projection World Map, which is the map that President Jimmy Carter used to display his agency’s efforts at his Nobel Peace Prize ceremony in December 2002. Most Americans have never seen this projection and instead can only imagine a world in which the United States is a prominent country almost literally at the center. While romantic and glamorous, that kind of distorted thinking hampers our ability to make rational and balanced judgements about our role and importance in the world. How does such a simple thing as reversing the poles or changing the “centering” influence your impression of what’s important? 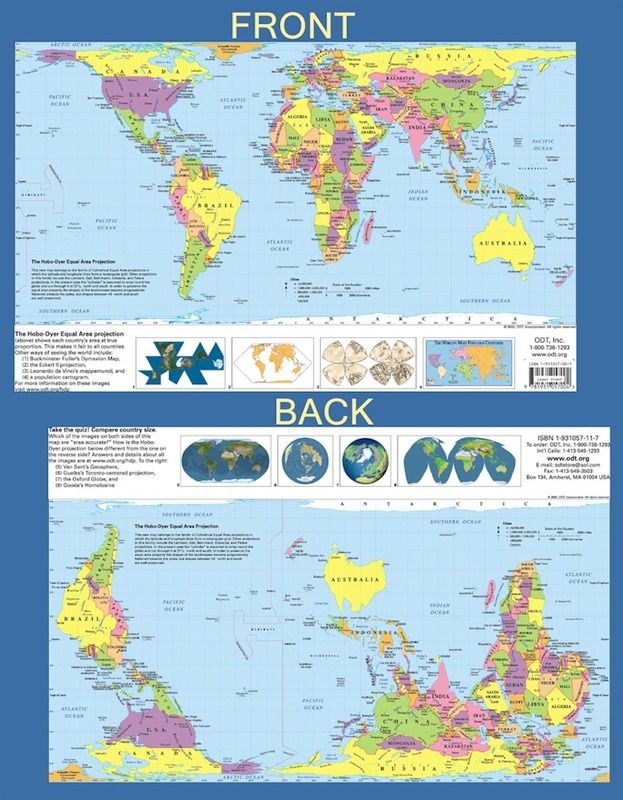 (Shameless promo section ahead… ) Totally3rdGrade.com has partnered with ODT Maps for a special packaged deal; we are offering a Teacher and the Rockbots “World” CD bundled with an 11×17 Hobo-Dyer World Projection Map for $14.95 (a $4 savings). If you are interested in acquiring modern resources that fit the modern era, click of the link below and it will take you to ODT Maps where you can make your purchase.